Nice picture, isn't it? If we're lucky, we might be getting a little design work done for the site by Seth Patrick, artist of the above picture. Check out his work here and his blog here. 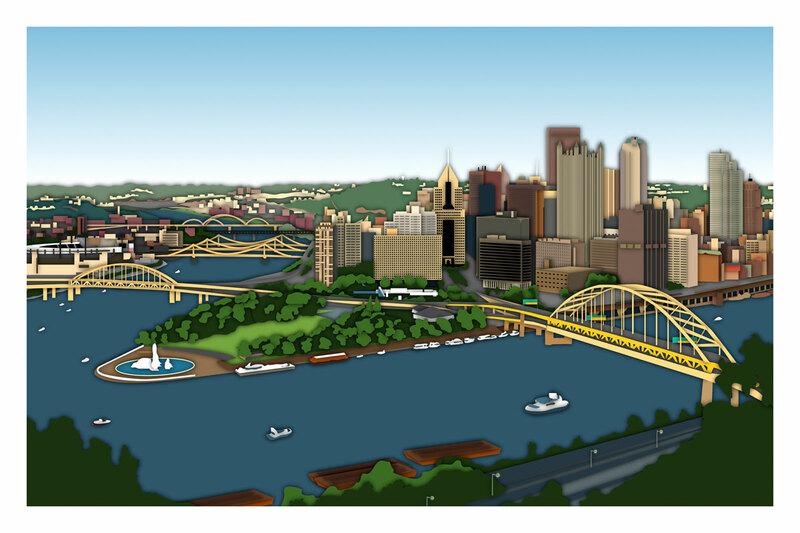 He does his work digitally and has some hilarious pop culture/political/sports pictures and does some great work depicting cities (like above). Definitely worth checking out, especially if you are from anywhere in Virginia (check out the site and you'll see what I mean). On a completely unrelated note, Pittsburgh's Favorite Potential Owner That Will Never Own a Pittsburgh Franchise has an interesting article up about blogging and its effect on mainstream media. Worth a read if you are bored and/or interested. Some of the better points are made in the comments section: blogging is, after all, probably alot more about opinion than it is about fact. Its an interesting debate that I won't elaborate further on, but feel free to strike up discussion in the comments section. Oh, and PSaMP caught that the Pens signed Talbot. The Trib updated again and they also signed Christiansen. Slow News Day, So How 'Bout a Video?